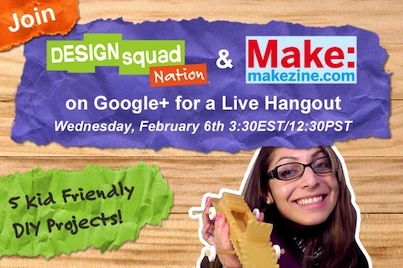 This Wednesday, Design Squad is joining forces with MAKE Magazine for a live STEM Google Hangout. The show’s host, Deysi Melgar, will be presenting 5 kid-friendly DIY projects that are perfect at-home or in-the-classroom activities. Educators are welcome to join in on the hangout to learn about these great classroom activities. The Live STEM Hangout will take place tomorrow, Wednesday, February 6th at 3:30EST/12:30PST. Check it out at this link: https://plus.google.com/+MAKE/posts. This entry was posted in Parent Resources, Teaching Tools and tagged STEM, teaching tools. Bookmark the permalink.